Here at UK Time Solutions, you’ll find a wide range of popular clocking in cards, time cards tailored to suit your clocking in machine or time recorder requirements specifically. The time cards we stock are available in a variety of designs, enabling you to choose weekly or monthly clocking in cards. We also provide a comprehensive range of job cards, technicians claim tickets and proximity key fobs and attendance swipe card badges. Our range of clocking in time cards are appropriate for most makes and models of clocking in machines, so why not check out our complete range of time cards here? We also provide contactless proximity attendance key fobs and swipe cards, not only do these allow you to clock in with ease, there are handy to attach to keys or carry in your purse or wallet so you needn’t worry about forgetting it! When it comes to calculating payroll, our attendance key fobs are an ideal solution. You’ll be able to record your employee’s working hours in a way that’s reliable and highly efficient, ensuring that employees are paid for the hours that they work. As well as this, our key fobs and cards are available in a range of sizes, colours and styles. Select from our range of clocking in cards below or give us a call for expert advise! For use with Computime Multitec Attendance Terminals. For use with Timevision, Protime & Infinity time and attendance systems. Box of 1000 C7082 Weekly Timecards. Box of 1000 C6704 clipper timecards. Pack of 100 CTM920M monthly time cards. Pack of 1000 CETR50W weekly timecards. Pack of 500 or 1000 PCT/1 technicians job tickets. Ideal for garages, workshops and repair facilities. Box of 1000 C7DAY attendance timecards. Pack of 50 time cards. Box of 1000 CCC job timing timecards. 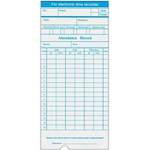 Pack of 100 Seiko bar-coded time cards for use with Seiko calculating time recorders. Supplied in a box of 1000 timecards. Pack of 1000 CPH punch hole timecards. Pack of 1000 CSCNDI time cards.